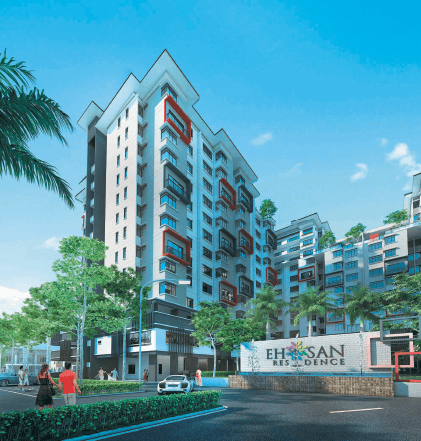 EHSAN AUCTIONEERS SDN BHD ventured into property development eight years ago and among its first projects was the revival of abandoned projects that it acquired. Since then, its property development arm, Ehsan Plant & Property Sdn Bhd, has developed RM250 million worth of projects. But what spurred bigger ambitions was when the company took on an abandoned project, called Apartment Dimensi, in Alor Gajah, Melaka, in 2010, Abandoned for 12 years, with uncompleted buildings on the site, the project was auctioned off at a reserve price of RM1 million, and was acquired by Ehsan Auctioneers for RM1.75 million. “The project was abandoned when the original developer went bankrupt. Some of the units had already been sold so we called the buyers and sat down with them to discuss pursuing the development. We then contacted government officials and the necessary parties on it,” Hamid explains. Apartment Dimensi, comprising four 5-storey blocks with a total of 96 units, was fully sold, and handed over in 2012. “With operations going smoothly and good cooperation from all parties, we managed to complete the project on time and the buyers were happy to receive their units. Now, most of the units are rented out to students of Universiti Teknologi Mara, which is just across the road,” Hamid says. The units, with three bedrooms, two bathrooms and a built-up of 900 sq ft, were sold at prices starting from RM118,000. Next was another abandoned project, Taman Pinggiran Markisa, on two acres of Malay reserve land in Nilai. The RM8.25 million project will be carried out in two phases. The first phase, featuring 24 single-storey bungalows with built-ups of 800 to 1,420 sq ft, was completed recently and handed over in January. The units were sold at a minimum price of RM358,000. Construction of the second phase, which involves three 2-storey bungalows, will start by the end of the year. They will have built-ups of 3,141 sq ft, and sell for RM1.2 million upwards. Hamid says about 90% of the company’s buyers are Malays. He explains that he is building houses priced below RM500,00 is to cater to those families earning about RM3,000 that cannot afford to purchase properties above a certain price level. He notes that while bumiputeras in the higher income groups can buy houses in the Klang Valley and even abroad, there are many more who can barely afford one. 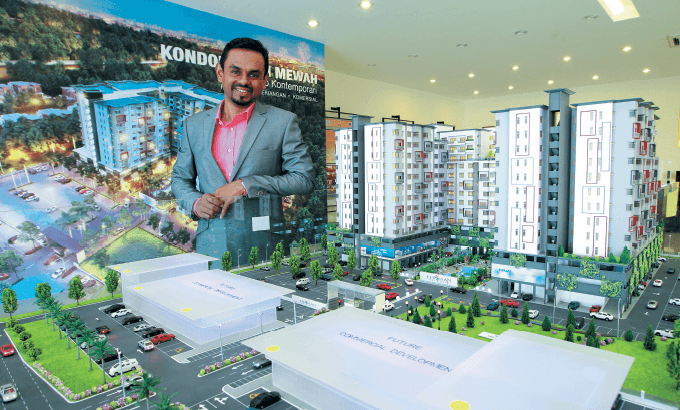 After reviving two abandoned projects, the company embarked on its first development on 14.27 acres of leasehold land in Tampin, Negeri Sembilan, dubbed Taman Salam Nadiah. The mixed-use development has a GDV of RM41.3 million and will be built in two phases. The first is the residential component, comprising 151 units of 1-storey terraced houses, with land areas of 22ft by 70ft and 20ft by 65ft, and built-ups of between 1,100 and 1,300 sq ft. Since they were launched last December at prices starting from RM168,000, 70% of the units have been sold. Phase one is 40% completed and slated to be completed in December 2016. The second phase comprises 13 units of shoplots that will be launched in September this year. With built-ups of 1,200 sq ft and selling prices ranging from RM478,000 to RM838,000, these units are due for completion by end-2016. Now, the company is focusing on its flagship project Ehsan Residence — a RM120 million low-density, high-rise residential development on six acres of freehold land in Sepang, Selangor. Launched on March 29, it comprises a 12-storey block offering 288 condominiums and 32 penthouses. A soft launch was held in January, and to date, 40% of the units have been taken up. “Ehsan Residence showcases a modern contemporary design. We expect more buyers on the launch date,” Hamid says. The units have built-ups of 1,070 to 1,135 sq ft with 3+1 bedrooms and 2 bathrooms, and the penthouses have built-ups of 2,244 sq ft, with 4+1 bedrooms and 4 bathrooms. Prices start from RM378,000. The units are dual-key units and owners can choose to install separate entrances if they want to rent out one section, Hamid says. “We provide this option for our buyers but looking at the current registrants, we see most, if not all, are families who will stay in the units,” says Hamid. “Ehsan Residence is targeted at buyers in Cyberjaya, Putrajaya, Nilai and Dengkil as it is just 20 minutes to the Kuala Lumpur International Airport, 20 minutes to Putrajaya and 10 minutes to Cyberjaya. The facilities include a gymnasium, two multi-purpose halls, barbecue area, nursery, convenience shop, swimming pool and wading pool. The development will feature three-tier security, with CCTV in some locations. Apart from the residential component, 14 units of 2 and 2½- storey shoplots will also be built on the site, with construction to start simultaneously. Hamid says the shoplots will cater for Ehsan Residence occupants. He says there has been some interest from food and beverage outlets, but he declines to disclose the names. Hamid has set a RM500 million GDV target for Ehsan Plant & Property in the next five years, including its current and upcoming projects. “While we’re growing in terms of our GDV, we will also grow in the types of projects we do and have a different target market in the coming years,” he says. While it may seem to have a lot on its plate, it has yet another upcoming development in Kluang, Johor, called Taman Sri Kluang. The gated residential development on 10 acres of freehold land will have a GDV of RM30.35 million. It will comprise 68 units of 1-storey semi-detached houses with built-ups ranging from 3,078 to 5,113 sq ft with selling prices starting from RM412,610 for the smaller units to RM484,955 for the larger ones. The company hopes to launch Taman Sri Kluang in early 2016, with completion scheduled in three years. He plans to build 500 units of 1-storey terraced houses in Teluk Intan, to be developed in three or four phases and sold at prices below RM200,000. In Sungai Petani, Hamid is planning develop a mixed-use development, with 2-storey terraced houses and shoplots. But he is also looking beyond property development and has set his sights on the hospitality sector. He wants to build and manage budget hotels in the future.